I think I’m a pretty good driver. I really do. In fact, most other people would say they’re pretty good drivers, too. But here’s the thing: there is always something you can learn that will help make you a better driver. That’s where Cadillac’s V-Performance Academy comes in. 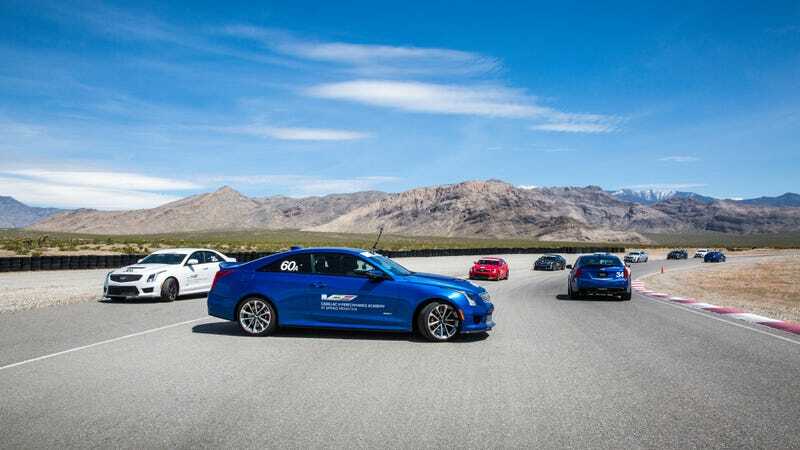 The V-Performance Academy is a two-day driving school at Spring Mountain Motorsports Ranch, about an hour away from Las Vegas, Nevada. It comes free with any 2017 Cadillac ATS-V or CTS-V. Once you sign up, the program will pair you with the car you bought. It’s pretty cool that way because if you bought a manual ATS-V, then you’d fly yourself to Vegas and get shuttled to Spring Mountain, where a manual ATS-V would be waiting for you. The first day was devoted solely to technical training: braking, steering and proper throttle modulation. The second day we put all those lessons to the test in four lead-follow track sessions. Between each new skill learned, we also went back inside for a classroom session. If you ever have the opportunity to attend a driving school, I highly encourage it, even if you do think you’re a good driver. Even if you only take away one lesson, I’d already consider that a win. Of course, the instructors were very careful to never call these two days “race school” but merely “driving school.” All of the skills they taught us, however, were ones they used on the track, which they believe if applied to everyday driving, would make everyone better overall. During the field test, we were told to reach a speed of about 35 miles per hour and then to stomp on the brakes after we passed a set of cones. Once we were used to that, we were then to do it again, but this time we were to turn into another lane after slamming on the brakes at the last second. This was to demonstrate that if an emergency situation happened to you, you know to brake first and then steer. Here, you can see me mess up the first time, steering before braking and taking a cone for a ride. Cue sheepishness. After the instructors set up seven cones in an empty swath of asphalt, we were to practice looking out through our side windows and anticipating our next moves while snaking our cars between the cones. Malone said way too many people develop tunnel vision after getting in the driver’s seat and he wanted us to use up as much of our visibility as we could. To fully drive the point home, on the last run through the cones, the instructors fully covered our windshields with sunshades, so we only had the side windows to see through. Mind you, the speeds were very low, but it was still very uncomfortable, like walking around blindfolded. Obviously, the front windshield should be the priority, but the side windows are crucial as well. The slalom test, held on the track’s main straight, was designed to show us what the cars would feel like under intense directional changes. Confidence naturally comes from knowing what your car can handle and the slalom test was good for establishing that. It was also super handy for feeling how the suspension stiffened up between driving modes. Above, you can see me get too excited and smack the rev-limiter in my enthusiasm. For the oval test, the instructors marked out an oval and told us to drive around it. Easy enough. But then they showed us how to hit the apex and then use throttle and brake modulation to alter the turning trajectory of the car by shifting its weight around. In the classroom, they showed us diagrams of how increasing throttle took weight off the front of the car, which widened the turn and how braking increased the weight in the front, which decreased the radius of the turn. Rolling on and off each pedal helped with balancing the car on the correct and fastest line. Learning how to look was one of the most stressed upon lessons throughout both days. When driving on the track, you always want to be looking ahead at what’s coming next, not staring at the bumper of the car in front of you. That limits your field of view and since your hands tend to follow your eyes, you’ll also pick up on the lead car’s mistakes if they make any. The same rules apply for everyday driving. Of course, keep an eye on the car in front of you. But also be looking at everything that’s going on around you. The more information you gather, the more aware you are and the better off you’ll be. Take driving on the highway, for example. You’re cruising along at 70 mph when you spot a slowdown up ahead. You ease onto the brakes because you’ve seen it from afar. Meanwhile, the car in front of you slams on its brakes and nearly gets into an accident because the driver wasn’t looking far enough. That’s the difference that looking can make. This wasn’t expressly taught in the classroom or during the driving portions of the academy, but it was something that was alluded to by each instructor. While I had him in the car with me, I asked one of the instructors if big egos and cockiness in students ever posed a problem at the driving academy. “Ohh yes,” he answered. He went on to say that they get plenty of students who sign up for driving school and then show up acting like they know everything already. Joking aside, showing up at driving school with an open mind might very well be the best prep work you can do. The instructors are usually professional drivers and they know what they’re talking about. Ask questions. Listen. While some track days are undoubtedly very good and are led by knowledgeable and professional drivers, some aren’t. Cadillac’s driving school was effective because they took us out and showed us how to perform all the different driving techniques and then took us back to the classroom and told us why our driving was affected in the way it was. That way, it wasn’t a bunch of abstract information thrown at us all at once. Learning it this way made it much easier to digest and remember. The curriculum was conceived largely by Malone and his team of driving instructors, so everything we went through they planned out. It was meticulous and in-depth—and way more confidence-inspiring than the 45-minute or so classroom session and two-ish instructor ride-along laps I did in my first track day. I do have one gripe and it was that the laps we did, though there were many, were all lead-follow. No hot laps. And just as I was finally getting the hang of the track and the car, it was time to end. As a result, I didn’t really get to see what it was like to push both the car and myself. It felt like a lot of hand-holding without a huge cathartic payoff at the end. Still, though, the last few laps I did, where I got to put everything I learned to the test, were by far the most rewarding.